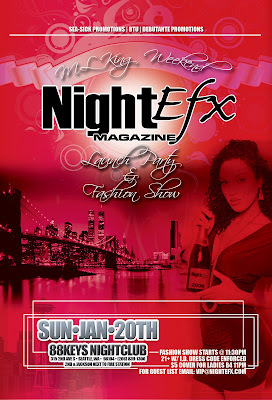 Most people will have a three day weekend and the people over at Nightefx Magazine are throwing a party. They'll be celebrating the launch of their first issue and I'm sure of many more to come. You too can go party with the Ghetto Prez and the models of the Be'Unique Agency. A fashion show will commence with clothing on display from Presidential Clothing and other area designers. So, be a part of NW history and make your way down to 88 Keys this Sunday. If you can't wait to grab a physical copy of the magazine, click here to view the first issue in pdf format. Even Gene Dexter is involved as the restaurant reviewer. Click on the flyer for further event details. This party is brought to you by Sea-Sick Promotions, BTU, and Debutante Promotions.